The U.S. Forest Service is seeking public comments on their proposal to burn 814 acres or 13% of Panthertown Valley on a regular rotation. 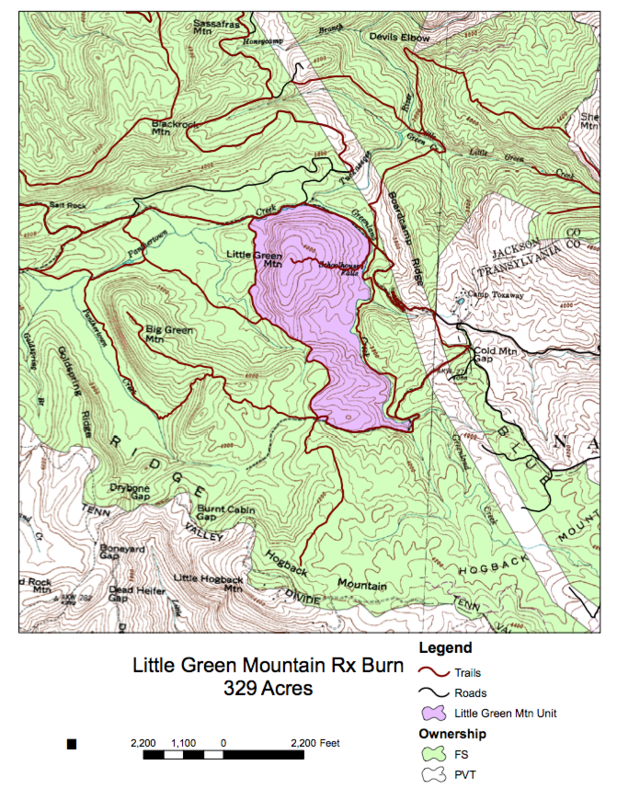 The proposed action would burn 485 acres on Blackrock Mountain and 329 acres on Little Green Mountain for 1-3 burning cycles up to 10-12 years. We are writing again because there was a typographic error in the comment database email address and we wish to correct that error. Comments may be sent by email to: comments- southern-north-carolina-nantahala-nantahala@fs.fed.us, in a common digital format, including .pdf, .docx, and .doc attachments. Please be sure to put Blackrock and Little Green Mountain in the subject line. Due to the difficulties caused to people who have not been able to comment by email, we are extending the reply-by date to May 9, 2019. The Forest Service regrets the inconvenience. Note also that areas in bold in this letter have been updated based on recent conversations with interested parties. 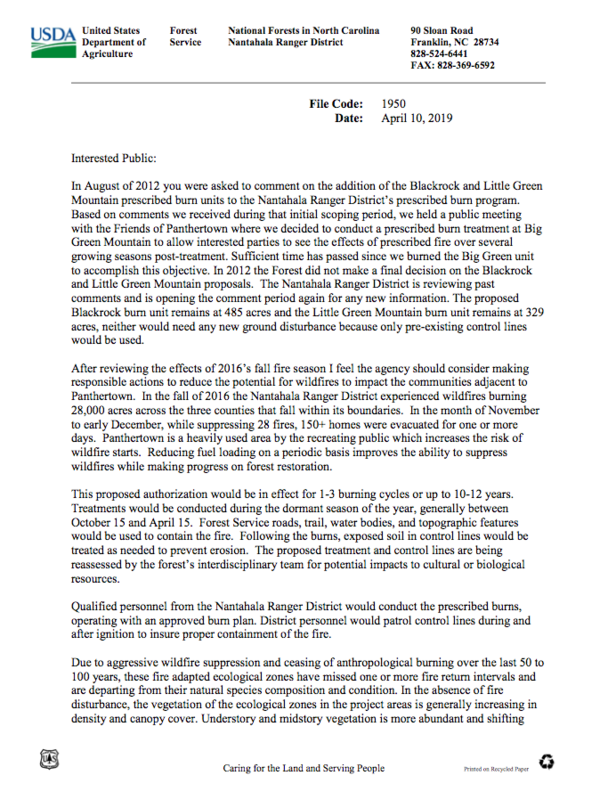 In August of 2012 you were asked to comment on the addition of the Blackrock and Little Green Mountain prescribed burn units to the Nantahala Ranger District’s prescribed burn program. Based on comments we received during that initial scoping period, we held a public meeting with the Friends of Panthertown where we decided to conduct a prescribed burn treatment at Big Green Mountain to allow interested parties to see the effects of prescribed fire over several growing seasons post-treatment. Sufficient time has passed since we burned the Big Green unit to accomplish this objective. In 2012 the Forest did not make a final decision on the Blackrock and Little Green Mountain proposals. The Nantahala Ranger District is reviewing past comments and is opening the comment period again for any new information. 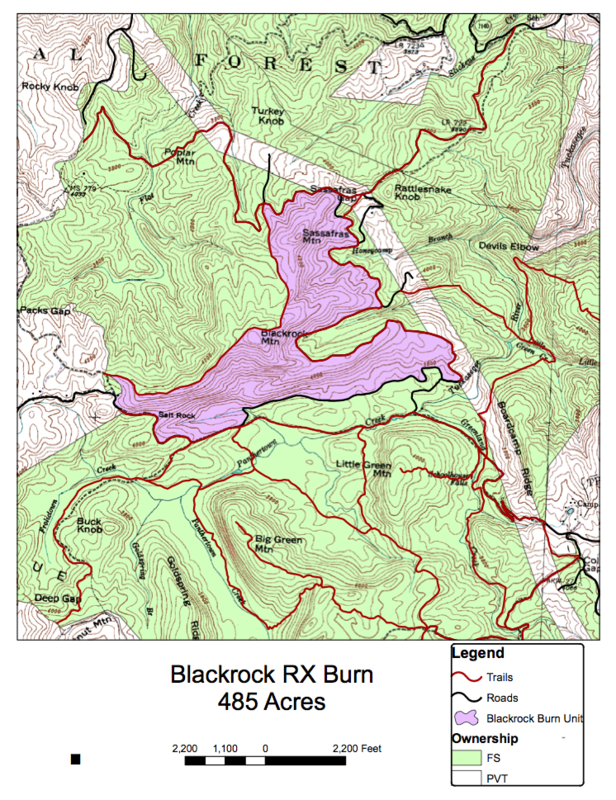 The proposed Blackrock burn unit remains at 485 acres and the Little Green Mountain burn unit remains at 329 acres, neither would need any new ground disturbance because only pre-existing control lines would be used. After reviewing the effects of 2016’s fall fire season I feel the agency should consider making responsible actions to reduce the potential for wildfires to impact the communities adjacent to Panthertown. In the fall of 2016 the Nantahala Ranger District experienced wildfires burning 28,000 acres across the three counties that fall within its boundaries. In the month of November to early December, while suppressing 28 fires, 150+ homes were evacuated for one or more days. Panthertown is a heavily used area by the recreating public which increases the risk of wildfire starts. Reducing fuel loading on a periodic basis improves the ability to suppress wildfires while making progress on forest restoration. This proposed authorization would be in effect for 1-3 burning cycles (at this stage of implementation, a cycle is every three to five years) or up to 10-12 years before we need to reassess the determinations of effects to botanical, wildlife, and fisheries resources. Treatments would be conducted during the dormant season of the year, generally between October 15 and April 15. Forest Service roads, trails, water bodies, and topographic features would be used to contain the fire. Following the burns, exposed soil in control lines would be treated as needed to prevent erosion. The proposed treatment and control lines are being reassessed by the forest’s interdisciplinary team for potential impacts to cultural or biological resources. Qualified personnel from the Nantahala Ranger District would conduct the prescribed burns, operating with an approved burn plan. District personnel would patrol control lines during and after ignition to insure proper containment of the fire. Due to aggressive wildfire suppression and ceasing of anthropological burning over the last 50 to 100 years, these fire adapted ecological zones have missed one or more fire return intervals and are departing from their natural species composition and condition. In the absence of fire disturbance, the vegetation of the ecological zones in the project areas is generally increasing in density and canopy cover. Understory and midstory vegetation is more abundant and shifting toward more shade tolerant species such as rhododendron (Rhododendron maximum), mountain laurel (Kalmia latifolia), red maple (Acer rubrum), and eastern white pine (Pinus strobus). Regeneration of fire adapted species such as oak (Quercus spp. ), hickory (Carya spp. ), and shortleaf pine (Pinus echinata) is decreasing. Grasses, forbs, and soft mast species are also becoming more limited. The desired condition of this project area is to promote the fire adapted ecosystems in terms of species, condition, and function. 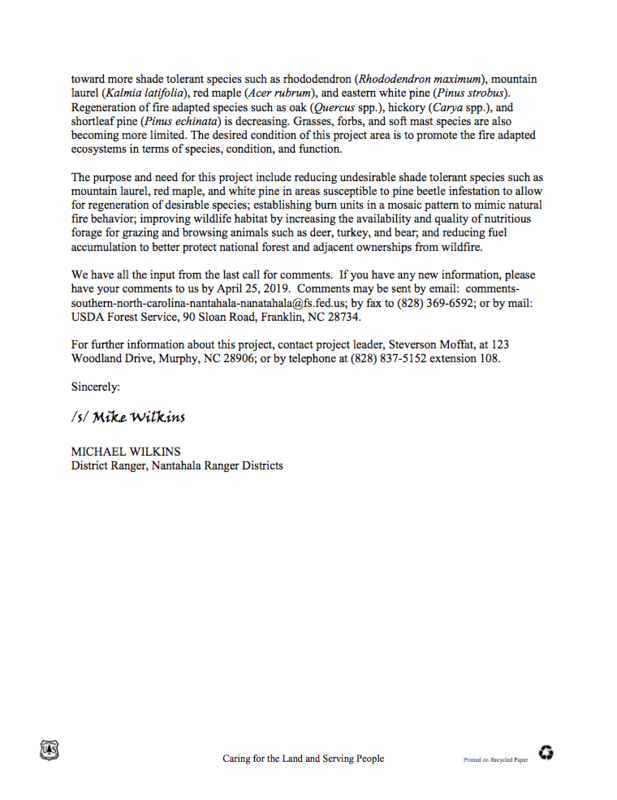 The purpose and need for this project include reducing the overabundance, but not the elimination of shade tolerant species such as mountain laurel, red maple, and white pine in areas susceptible to pine beetle infestation and to allow for regeneration of desirable species; establishing burn units in a mosaic pattern to mimic natural fire behavior; improving wildlife habitat by increasing the availability and quality of nutritious forage for grazing and browsing animals such as deer, turkey, and bear; and reducing fuel accumulation to better protect national forest and adjacent ownerships from wildfire. We have all the input from the last call for comments. If you have any new information, please have your comments to us by May 9, 2019. Comments may be sent by email: comments- southern-north-carolina-nantahala-nantahala@fs.fed.us; by fax to (828) 369-6592; or by mail: USDA Forest Service, 90 Sloan Road, Franklin, NC 28734. For further information about this project, contact project leader, Steverson Moffat, at 123 Woodland Drive, Murphy, NC 28906; or by telephone at (828) 837-5152 extension 108. Friends of Panthertown’s current position related to this proposed action by the U.S. Forest Service remains the same as our 2012 position which is explained in detail in our comments below.